RIM, maker of the BlackBerry, said Thursday that it had corrected problems with sending and receiving e-mail on the devices. Statement from devices' maker: "Technical teams are working to resolve this issue"
(CNN) -- Users of BlackBerry phones in North America reported widespread interruptions in sending and receiving e-mail Thursday. Research in Motion Ltd., maker of the devices popular with business workers, released a statement apologizing for the problems. RIM did not give specifics on how they occurred or how many users were affected. "BlackBerry customers in North America may be currently experiencing delays receiving email. Our technical teams are working to resolve this issue for those impacted," the statement said. "Phone services, browsing and PIN-to-PIN messaging are not impacted. We apologize for any inconvenience." Phone service and Web browsing are not affected, RIM said. Shortly before 2 p.m. 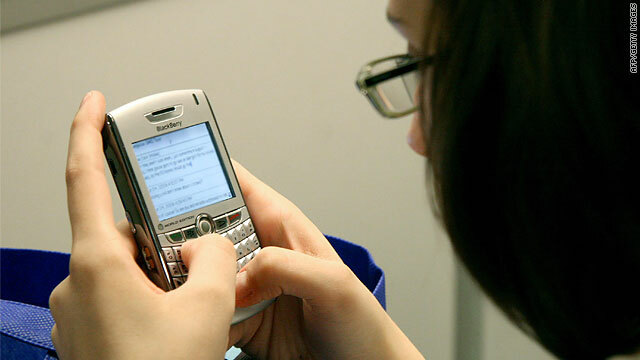 ET, RIM released a follow-up statement that said the company had isolated and resolved the problem: "Some customers may still experience delays as email queues are processed. RIM is continuing to investigate the cause of the issue." RIM said it had about 32 million global BlackBerry subscribers as of the end of August. BlackBerry phones run on multiple wireless carriers, including AT&T, Sprint Nextel and Verizon. Chrystal Davis, a spokeswoman for Sprint Nextel Corp., said outages started about 3 a.m. ET. She said RIM was doing some maintenance work on some of their services when the problem occurred. Davis said that only Sprint's general customers have been affected, not enterprise or business clients. She did not know how many customers did not have service Thursday afternoon but said RIM was "aggressively working to solve the issue." The Web was abuzz with complaints about the outages, with the topic trending on Twitter and occupying four of the top 10 search topics on Google.